Dave Brundage's pitcher burst into tears, author John Feinstein wrote, but they were tears of joy. That pitcher, J.C. Boscan, was in his 14th professional season in 2010 and he hadn't gotten a major league call - until that September. It was Brundage, manager at AAA Gwinnett, who got to break the news. "I've been a minor league manager for a long time," Brundage told Feinstein in Feinstein's 2015 book "Where Nobody Knows Your Name," "I can honestly say that was the best moment I've ever had." Brundage has had his own long career as both a player and a manager, one that has yet to see the majors. His playing career lasted parts of 10 seasons and his managerial career has lasted another two decades. He's made AAA in both, but he never gotten that call himself. 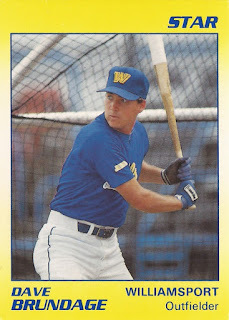 Brundage's playing career began in 1986, taken in the fourth round of the draft by the Phillies out of Oregon State University. At Oregon State, Brundage helped his team to a division title in 1986. He was an outfielder and a pitcher. Brundage started with the Phillies at single-A Spartanburg and Clearwater. He hit .227 over 63 games. He made AA Reading for 14 games in 1987. He moved to the Marners and AA Vermont for 1988, hitting .248 there. He then made AAA Calgary for the first time in 1989, getting 27 games there. He played another 92 games at Calgary in 1990, hitting .304. "People ask me what I did well ... I'll tell them I didn't do anything above average," Brundage told The Tacoma News Tribune years later. "But I always thought my mind was above average. And when you're average, you better have some sort of intangibles." Brundage continued playing regularly at AAA through 1992. He then played briefly in three more seasons, ending his playing career. His minor league managerial career began in 1995, at high-A Riverside. He made AA Memphis in 1997, then AAA Tacoma in 1998. From 2001 to 2005, Brundage served as manager at AA San Antonio. In 2004, he watched over a young Felix Hernandez. He explained to The Seattle Times that he looked for how his players deal with adversity. Hernandez, he said, had done that and done it well. "You certainly don't wish bad things on any of the kids, but you hope for some struggle, to see how they deal with adversity," Brundage told The Times. "When you always throw the ball right by someone, you don't learn anything." Brundage moved to the Braves and AAA Richmond for 2007. He stayed at AAA there through 2012. He then took over at AAA Lehigh Valley for the Phillies. He continues there for 2015. "I see how they operate and treat people and that is something I will take with me forever wherever I go " Brundage told The Morning Call. "I like to play aggressive and I like our teams to be prepared."